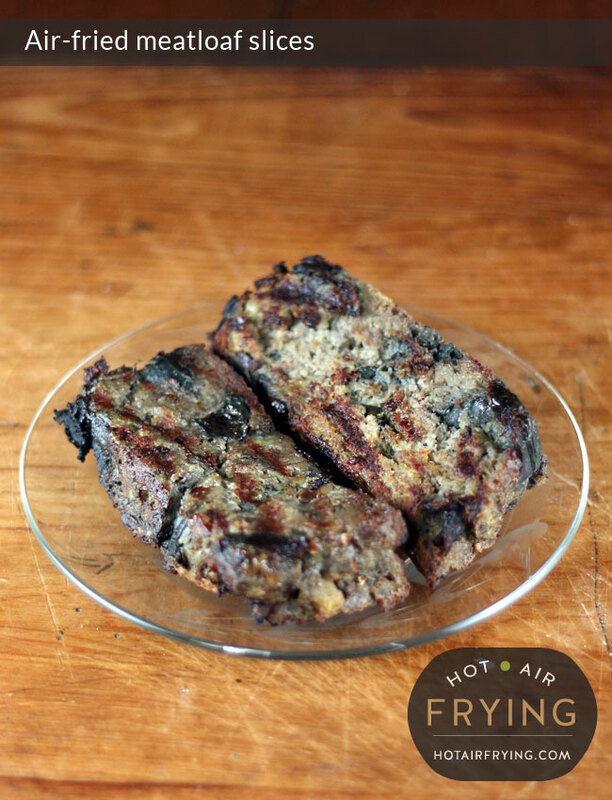 This gives leftover meatloaf a whole new appeal, when you serve it up with the taste and look of grill marks on it, and crunchy surfaces all over. As usual, first the recipe, then the discussion. Cut the slices about 2 cm (1 inch or so) thick. Turning each slice over carefully, spray each side with cooking spray. Using a flexible flipper (aka spatula aka fish slice), slide the flipper under each slice and arrange carefully in the basket of your air fryer. Do not stack. It's okay if they are close together, even if sides touch. Air fry for about 10 minutes until the slices have browned and crisped a bit. Do not turn over during cooking. If you are multiplying the quantities in the recipe, only do as many slices at one time as will fit in without stacking. Do in separate batches if you need to, keeping warm on a covered plate. This works great with basket-type air fryers such as a Philips Airfryer™. It will work fine for paddle-type air fryers such as an Actifry™ if you have a 2-in-1 tray or a snacking tray -- but definitely do not put the slices into the bowl with the paddle. It really is best to start off with cold, leftover meatloaf straight from the fridge, as it stays together best for the prep and cooking stages. If the slices are too crumbly to turn over for spraying, you'll just have to settle with spraying one side only. A good quality meatloaf is a thing of beauty to be admired and enjoyed. Leftover meatloaf, though always welcomed, can be a bit less interesting, as it usually gets the microwave-reheat treatment. The hot air method of reheating slices makes each slice look appealing, and results in a crispy outside to contrast with the soft, satisfying inside. The all-over crispness is nice. Many people fight to get the end slices of a meatloaf, anyway, as they have the most crispy “bark” on them. The nutrition will of course vary based on the meatloaf you use. 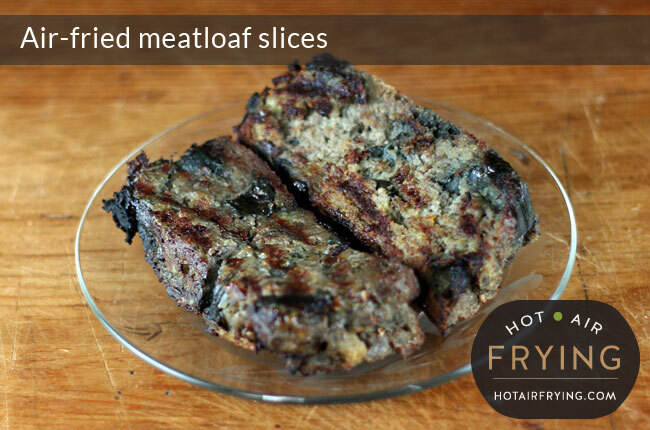 Meatloaf need not be fattening at all: good meatloaf (I feel) is a mixture of meats, and a meatloaf made from lean ground beef, lean ground pork, and lean ground turkey can be light as well as delicious and juicy, not try at all. The meatloaf pictured was made with chunks of air roasted eggplant in it for added meatiness and juiciness. It was so good reheated this way I have to confess I did not just have two slices of it.